A week ago running backs coach Ryan Held was asked who was looking good in practice. He said junior college transfer Greg Bell was probably the top standout, at least of that day. 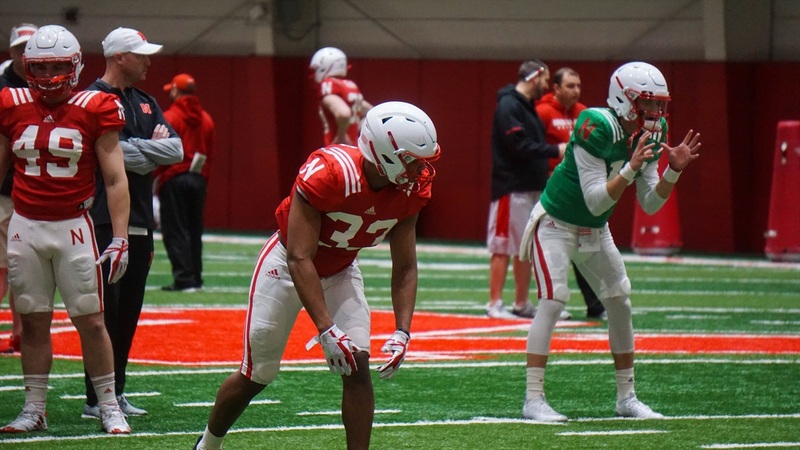 By some, Bell is pegged to be the Huskers’ lead guy when they open the season, but there’s another guy competing for that title that media continues to hear about when the running backs come up: sophomore Jaylin Bradley. In high school, Bradley was offered by the Husker’ staff, both the old one he committed to and the new one that inherited him. He said Central Florida and the up-tempo spread offense it ran was one of his “top picks,” so when he found out Frost was coming to Lincoln, his reaction was a simple one. Bradley’s skillset lends itself perfectly to the Huskers’ new offense. He feels comfortable at that “Duck R” position as a receiver — a position the staff is comfortable with him in as well — and he said he "really enjoys" getting out and running routes. Because of his previous relationship with the offensive staff and the similarity of this new offense to his old high school one (you know, the one he broke records in), the adjustment period that comes with a coaching transition hasn’t been as bad. Bradley was the top skill player in the state in the 2016 class, but he got limited opportunities to prove his stuff during his freshman campaign. Bradley’s usage, at times, felt almost obligatory; a sort of, “Okay Jaylin hasn’t been in, let’s give him three carries here and call it good” kind of situation. He seems to have a new outlook with this new staff. Part of that has to do with the investment Held has made in him; Bradley says the coach has been pushing him ever since they started Spring ball. Everybody’s had gains in the weight room since the winter, Bradley is no different. He specifically went to Duval looking to improve his speed. They worked on squats, box jumps and other jumping techniques to amplify his athleticism. Bradley’s huskers.com page lists him at 180 pounds; he says he’s at 205. It hasn’t cost him his speed. Another area of growth? Patience. He credited that anxiousness to youth and just being unfamiliar with the flow of the college game. He’s a year older now and there’s no doubt the turbocharger that was added to Nebraska’s practices has played a role in helping to grow his comfort. Bradley says Held has helped, too. He’s energized their room but also brought them closer together, in his mind they’re a lot closer now than they were last year. Held has a rule that if a running back scores, the rest of the backs better be the first ones to meet him and congratulate him on the sideline. “It don’t matter if you’re in or not, if somebody scores, we better be the first people down there to celebrate with our teammates,” Bradley says. You’d think creating that kind of bond would make it hard to compete with one another for one spot. “Not really,” Bradley says. Neither Held nor offensive coordinator Troy Walters is ready to award that spot yet — it’s still “pretty even” as far as Bradley can tell — but the Bellevue back feels like his shiftiness gives him an edge.